Brioche Pastry Shop — orange rolls. Filled with cinnamon and orange zest, baked until they puff up then drizzled with a sweet orange glaze. Eat them warm. Owners Ida and Brandon Kelley also serve Shortwave Coffee from Columbia, Missouri and the most delicious fruit Danishes, bear claws, pecan rolls, cinnamon rolls, croissants and more, made from laminated brioche dough (which makes them crispy and caramel-colored on the outside and flaky and soft inside). Bloom Baking Co. — bierock. Available on the new lunch menu, it’s ground chuck, shredded cabbage and onions baked inside a fresh roll, with spicy brown mustard on the side. Stroll in after you have shopped the farmer’s market for a loaf of freshly baked bread, half dozen French macarons, pineapple Danish or a flourless chocolate torte; or croissants, pies, cakes and more. Dolce Bakery. Some of the most comforting and quality-made pastries in KC. Get there early for the lemon blueberry rolls and a cup of coffee, or shop the pastry cases for oatmeal cream pies, lemon bars, cream cheese brownies, and chocolate chunk, peanut butter or snickerdoodle cookies. There are also fresh fruit hand pies and individual key lime tarts. YUM, a boutique bakery. Owner/chef An Zebley brings a vintage style and sensibility to her shop. She makes everything from scratch using quality ingredients. Recent offerings include pear-honey cupcakes (a moist honey cake soaked in pear-honey syrup and topped with honey buttercream). Her root beer float cupcakes with vanilla cake, root beer buttercream, freshly whipped cream and a cherry on top are also a throwback you’ll want to throw in your mouth. She posts daily specials and flash sales on the bakery’s Facebook page. 1900 Barker Bakery and Café — coffee and bread. These are the two fundamentals for many of us in the morning, and that is exactly what Taylor Petrehn, a talented baker, and his brother, Reagan, an experienced and skilled barista, are offering. Taylor received his first semifinalist nod from the James Beard Foundation for Outstanding Baker in 2017, for his work using local heirloom grains to make his breads and pastries. 1900 Barker Bakery and Café — pizza. Made on Wednesdays and topped with local seasonal produce like leeks. 1900 Barker Bakery and Café — Danishes. Made with laminated dough and filled with savory fillings like sweet corn and potato, or sweet ones like peach and thyme or blueberry. Johnson County Community College Pastry Shop. Every Friday during the school year, students in the pastry/baking certificate program sell their pastries to the general public. The selection varies; expect to see breads, rolls, pastries, cookies and cakes. (They even made cronuts last year!). They’re sold for a song and the students use only the highest quality ingredients. The bake sales should resume in late August or early September when the students are back in school; they start at 3 p.m. until they sell out (usually around 5:30 p.m.). Heirloom Bakery & Hearth — breakfast biscuit. It’s flaky and buttery. They have a handful of savory pastries with whatever fruit or herbs are in season. Best Regards Bakery & Café — chocolate éclairs. The dough is light and airy and the custard is creamy with a bittersweet chocolate icing. Also, because they have that wonderful Hummer of a French oven to bake bread, they also make great sandwiches. Best Regards Bakery & Café — cream puffs. Best Regards Bakery & Café — cinnamon rolls. Cookie Jar Bakery — cinnamon rolls. It’s made with puff pastry, so it’s not quite as heavy. The texture is crisp and you’re done in two bites. Cookie Jar Bakery — salted caramel brownie. Cookie Jar Bakery — iced sugar cookies. Owner Lisa Hatfield is the queen of sugar cookies for me. Available in all types of shapes and themes. Cookie Jar Bakery — ooey gooey butter bars. In different variations. M & M Bakery and Delicatessen. It reminds me of my godparents’ bakery. Classic, old-fashioned cookies, doughnuts and mini cheesecakes. Pat does great cookies and HUGE apple fritters. He does wonderful birthday and wedding cakes as well. There’s also a deli counter where the Hook ‘M Up sandwich has become famous. Boulevard Bakery. Also reminds me of my godparents’ bakery. I go here for the iced sugar cookies, but the cinnamon rolls and doughnuts are excellent as well. Andre’s Confiserie Suisse. Where else can you go in Kansas City and feel as though you are in a Swiss chalet? I love anything from Andre’s that’s dipped in chocolate. My favorites are the chocolate pecan heart cookies (shortbread pecan cookie dipped in milk or dark chocolate) and the meringue balls (two crisp meringue balls sandwiched together with ganache and dipped in milk or dark chocolate). Irina’s Gourmet Bakery. Irina’s definitely has a European feel. I call it the “tortes and tarts bakery.” There are some wonderful sliced tortes and tarts in different sizes. They also do Danish pastries and bread, and serve lunch. Bloom Baking Co. – macarons. They are bright and colorful, light and airy. And delicious. Andre’s Confiserie Suisse. The most visually elegant pastries in the city … and they taste as good as they look since they’re loaded with calories. But you’re worth it. Elvira’s Cakes. Great selection of desserts, pastries, flan, breads and breakfast pastries. Stays open late. Tous les Jours Bakery. 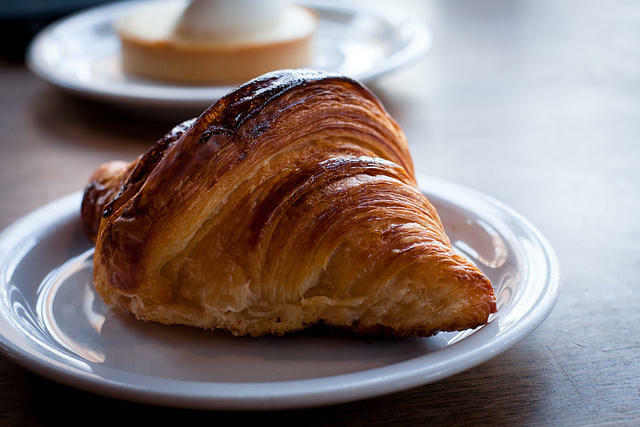 A French-style Asian bakery that has a beautiful selection of sweet and savory items. Also stays open late. Le Monde Bakery. Terrific neighborhood bakery. McLain’s. It reminds me a lot of the bakeries I grew up going to: bake shops that serve really sugary stuff. It’s sort of an iconic Kansas City place. I’ve always been a huge fan of their incredibly sugary but incredibly good pineapple rolls. Tous les Jours — croquettes. Fresh, hot and they melt in your mouth. One is filled with kimchi, another has curry in it. They also have a nice selection of beautiful cakes. Ibis Bakery — almond croissants. Ibis Bakery — country bread. It tastes exactly like the bread I had in Italy. Alchemy Coffee & Bake House in Lawrence — hand pies. They also have other great baked goods. Homestead Kitchen & Bakery in Baldwin City, Kansas — cinnamon rolls. Aunt Mary’s — strawberry shortcake cookie. It tastes just like strawberry shortcake. Aunt Mary’s — lemon bars. Hearth Baking Company in Weston. It has the only brick baking oven in Missouri and they have the most wonderful crusty bread that’s moist inside. The lemon scones are also to die for. Meriwether's in Leavenworth — doughnuts. They make standard and artisan ones. The lemon is just incredible, as are the strawberry-basil doughnuts. Clock Tower Bakery — macarons. There’s a relatively well-known corridor of Southwest Boulevard on Kansas City’s Westside — it’s a strip of Latin American restaurants and shops. Sandwiched in between a beauty salon and a late night Mexican eatery is a small bakery: Panaderia de las Americas. There’s a lot that can go between two slices of bread. Portable and fuss-free — no need for utensils — sandwiches are perfect for work lunches or picnics. Nothing says “It’s fall!” like a delicious dessert to accompany a warm cup of cocoa. From fried apple pies to good ol' carrot cake, we’ve got the treats that will make your season sweet. On Central Standard’s food show this week, KCUR's Food Critics searched out the best desserts in and around Kansas City.